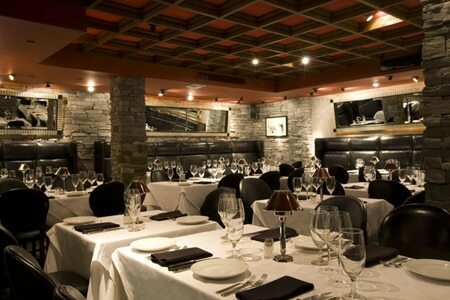 Mastro's ensures that steakhouse traditions remain alive and well in Beverly Hills. : An import from Scottsdale, Arizona, Mastro's embraces classic steakhouse traditions as warmly as it welcomes the moneyed clientele that frequent this bustling eatery. It's a celebrity favorite, too. A relatively sedate dining room occupies the ground floor, while a lively bar scene --- downright boisterous by buttoned-down steakhouse standards --- awaits upstairs, along with additional dining space. The Penthouse at Mastro's occupies the third floor, featuring a terrace, the Canon Room with a wall of wine bottles, and sushi in addition to Mastro's menu. The straightforward but pricey bill of fare features New York strip, porterhouse and rib-eye steaks, a very respectable rack of lamb and a smattering of options for non-carnivores (salmon, live Maine lobster). Traditional steakhouse starters include a dramatically presented seafood tower (with dry ice special effects) and a gargantuan wedge of iceberg lettuce. Sides fall in line accordingly, with creamed corn, asparagus and garlic mashed potatoes. If you still have room, try one of the classical, delightful desserts, such as the chocolate pudding cake or the pecan pie. You'll find plenty of big red wines on the pricey list; the martinis here are legendary. Make plans for May 12th with GAYOT's lists of Mother's Day Brunch Restaurants in your area.